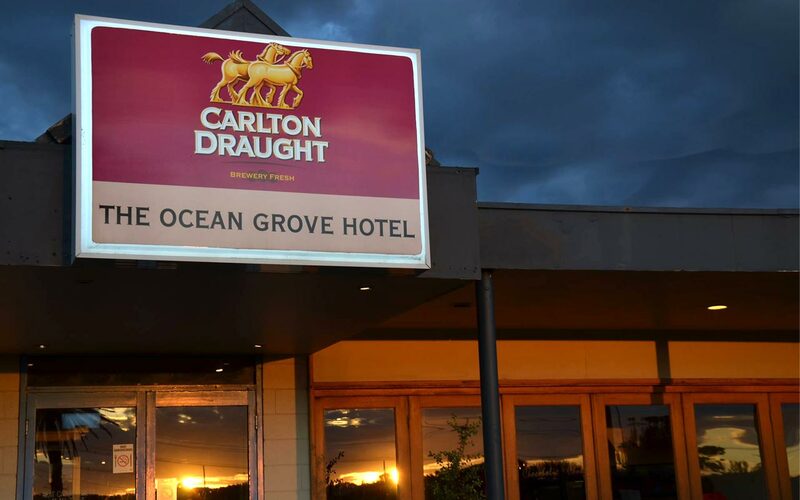 The Ocean Grove Hotel has steadily become the place for locals and holiday makers alike to visit to enjoy the relaxed atmosphere of the open beer gardens, in ground trampolines and play area for the children as well as the delicious menu created by Head Chef Ken Wall. If a more casual dining experience is what you are looking for then the front bar, fully equipped with its 4 large flat screen tv’s and pool table, is the place for you. Live sport airs daily on Foxtel plus full bar menu is available with cold beers on tap. Set within 150m from the beach, the hotel serves lunch and dinner 7 days a week with a menu including dishes ranging from Traditional Pub fair to finer cuisine. The OGH can also accommodate any function that you are needing to organise, from small end of season gatherings to larger bookings celebrating one of life’s more special events.